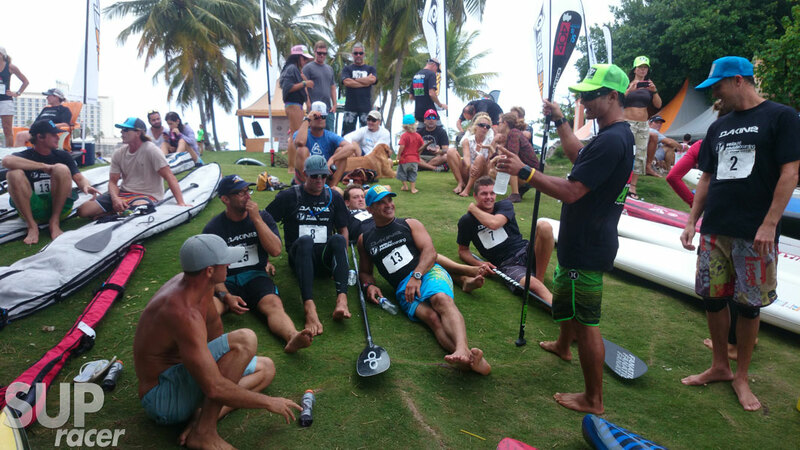 Danny Ching and Lina Augaitis have taken out the 2013 Paddle Royal in Puerto Rico after an incredibly tight second day of racing. Danny claimed the overall victory by winning the final round of racing on Day Two, ending the hopes that both Aussie young gun Jake Jensen and Frenchman Eric Terrien had of flying home with the $7,000 winner’s prize. Danny had all the work to do after finishing third in yesterday’s Long Distance Race and left it until the very end to fight his way back into the lead. Coming into the final round of racing, which consisted of a 200m straight-line sprint, Danny was sitting third on the overall points leaderboard, one point behind Eric and two behind Jake. The reigning champ basically had to win the last race and hope Jake didn’t get second. And, as if the script had been written, that’s exactly what happened as the event finished in very exciting fashion. Danny leapfrogged his two close rivals and walked away with the title literally at the very last second. Danny and Jake were actually tied on top of the leaderboard at the end of the weekend (10 points each), however Danny won on a “Who had the most first places?” count-back (2x race victories to Jake’s 1x). The top three guys – Danny, Jake and Eric – were the clear standouts this event. As you can see from the leaderboard points they all finished well clear of the pack. Speaking of the pack, it was an amazing turnaround from Slater Trout, who finished outside the Top 10 in yesterday’s Distance Race only to come charging home and take 4th place overall with a string of strong results in the Course and Sprint Races (including a victory in the second Course Race). Slater finished just ahead of Chase Kosterlitz (5th overall), who in turn edged out Chuck Glynn (6th overall) and Ryan Helm (7th overall) with a strong final race. Meanwhile in the women’s race it was Lina Augaitis all the way, with the Canadian too strong for Brandi Baksic (2nd overall), while Gail Vento battled past Helga Goebel to take the final podium spot. Lina showed she will be one to watch next year, taking out not only yesterday’s Distance Race but also all but one of today’s shorter course races. We’ll have a full recap (plus photos of the action) up shortly. In the meantime you can scroll down to see results of each of today’s short course races, or scroll right down to see the recap of yesterday’s epic Long Distance Race. “And so Ryan you’re going to block Eric and Thomas you’re going to cover Jake. Give ya $500 each if we pull this off…” The pro guys looking as relaxed as you possibly could when thousands of dollars are on the line. This was taken before the final race of the day, which would decide who took first overall ($7,000), who took second ($4,000) and who took third ($2,500). L-R: Ryan, Eric, Chase, Belar, Thomas, Jake, Danny, Chance. Danny takes the final race to claim the overall Paddle Royal title in dramatic fashion. 9th: Thomas Maximus: 7, 7, 10, 11, 9, ? = 44? 10th: Bill Kraft: 10, 10, 9, 14, 11, ? = 52? Best five out of six results count. These are unofficial official results. SUNDAY LIVE UPDATE #3: LINA WINS! 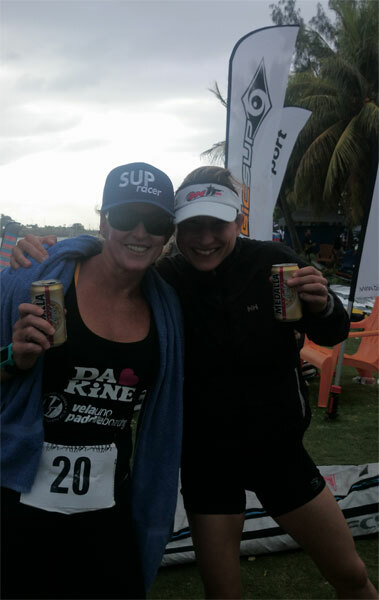 Lina Augaitis WINS Paddle Royal 2013… There’s still one race left to paddle but Lina has an unbeatable lead over Brandi. SUNDAY LIVE UPDATE #2: THE RACING IS ON! It’s 8am and in a few hours we’ll be back on the water to wrap up Paddle Royal 2013. After yesterday’s brutal Long Distance Race today sees four shorter races that, combined with yesterday’s results, will produce the overall Paddle Royal champions. I didn’t think the wind could get any stronger than it was yesterday, but looking out the window of our hotel it’s absolutely HOWLING out there right now. 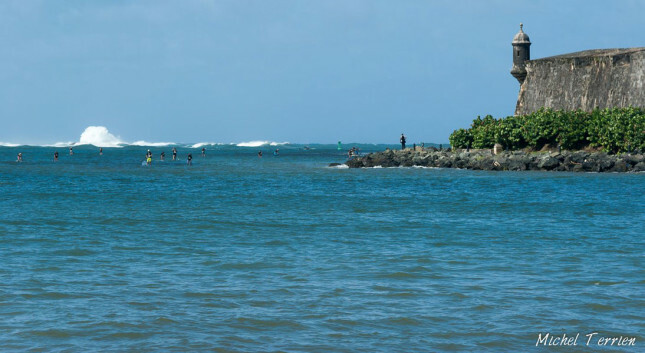 That’s going to make today’s races very interesting, because even though they’re held on the “protected” lagoon, the water is still very rough and bumpy right now. Scroll down for complete results from Day One’s Distance Race, including the current overall standings heading into today’s Short Course and Sprint Races, which will decide who claims the overall title. Eric Terrien has just taken out the Long Distance race on Day One of Paddle Royal, triumphing over Jake Jensen, Danny Ching and an all-star field in a race that featured some pretty brutal conditions. Meanwhile Lina Augaitis lived up to our prediction of being pre-race favourite, taking out the 9-mile race ahead of Brandi Baksic and Helga Goebel. We woke this morning to howling winds and a solid increase in swell. Some of us were hopeful the organisers would run the original course, which included the open ocean leg, while others were quietly hoping an alternative course would be introduced. The decision was made easy in the end, as the Coast Guard shut it down and forced the race to be held inside the protected lagoon and bay. We all lined up for the unique start to the race – inspired by sailing, competitors had a “starting zone” between two lines of buoys, in which we had 30 seconds to start paddling and try and hit the the start line at full speed – and as soon as the gun went, the usual suspects were out front. Most of the guys that I tipped to go top 10 were out front early and pretty soon a seven-man pack had formed, featuring Jake, Slater, Danny, Eric, Ryan, Chuck and Chase. The course called for a quick lap of the lagoon and a couple of trips under the bridges, before hitting the straight 4km downwind stretch from the lagoon right out into San Juan Bay. That was the fun part. By the time we hit the open bay there were actually some very solid little bumps making for a nice mini downwinder. After that we rounded the corner and headed almost all the way out into the ocean, before turning around and paddling back the way we came. The halfway turning buoy, located right at the border between the bay and the ocean, became an interesting landmark. By the time we were approaching halfway I was sitting in 15th, with the lead pack about three minutes ahead. This gave me a very clear view of the top five as they rounded the buoy and charged back in to start the second half of the race. Sitting in around 6th place at the turning buoy, Ryan found himself stuck in front of a giant, half-breaking swell as he headed back inside the bay. The thing could have easily swallowed him up and taken his board onto the rocks, but instead Ryan (who’s an incredibly good surfer in case you weren’t aware) caught the wave of the day and surfed the bomb set about 100 metres up and past a couple of his rivals. Apparently someone got pics of it. I hope so… it was epic. This was the 4km section that’s more or less a straight run back to the finish, which in the first half of the race had been a fun downwinder but was now a brutal, punishing paddle directly against a howling, 30-knot-plus wind. As soon as we turned the corner into the wind everyone’s speed dropped significantly and most of us went into survival mode. There were bodies everywhere… paddlers were blown all over the place and despite trying to hug the left-hand bank, there was no respite from the wind. 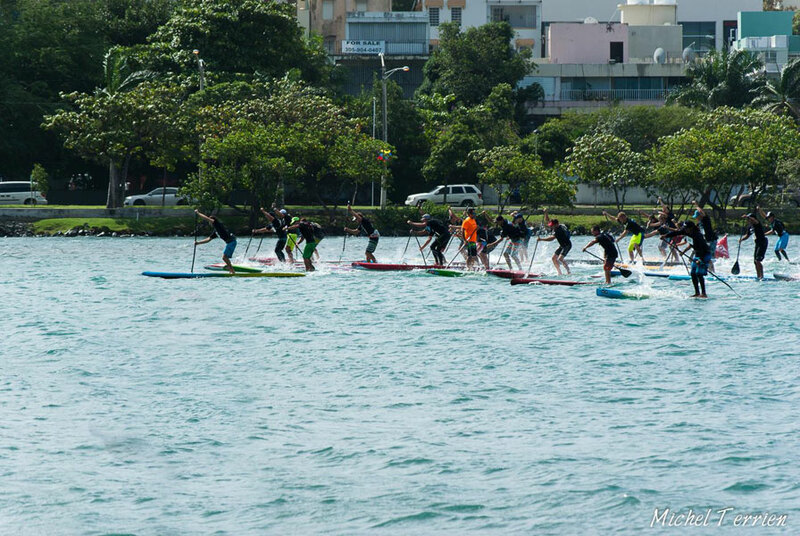 The leaders were still charging ahead and battling for the top spots, but most paddlers were simply hanging on, or at least I know I was. As I looked around I could see the packs separating. Suddenly draft trains were a luxury in the never-ending, oncoming bumps. If you could manage to stay with one you would hang onto it as if the guy in front of you was a lifeboat from the Titanic. For most people it was a lonely, painful solo mission all the way home. The pros survived though, especially the likes of Eric Terrien, Jake Jensen and Danny Ching, who broke the rest of the pack on the paddle home and filled the top three spots as I’d predicted, though I didn’t predict that Eric would win and Danny would get third. It was an amazing performance by the Frenchman, an effort to go alongside his epic win at the Lost Mills in June and cementing his place as one of the best in the world. Jake looked strong all race and was unlucky not to take the win. At the beginning of the upwind leg he had a gap on Eric and Danny but, sensing they were closing in and that he was wasting energy paddling solo, he stopped and waited for them to regroup. Eric would later tell him it was a mistake, as he wasn’t entirely confident the two of them would have ever caught the young Aussie. Danny, struggling slightly with a combination of bad shoulder, bad conditions and just plain simply not his best ever race, came home in third after Jake and Eric sprinted away to the line. Also mightily impressive were Chase Kosterlitz and Chuck Glynn (who is one to watch in the future), who came home strong and almost caught Danny at the end. It was a fine effort also from Thomas Maximus, who made my prediction (I had him in 10th) look a shambles by finishing a very solid seventh (he had in fact been sitting in sixth and basically pulled home Ryan Helm in the final stages of the upwind leg). There were also fine efforts from the Spaniard Belar Diaz as well as locals Nick Leason (Puerto Rico) and Bill Kraft (BVIs… who, with apologies, was listed as “local guy” in our results immediately after the race). Meanwhile in the women’s race Lina Augaitis lived up to her pre-race favouritism by taking the win ahead of Brandi Baksic, while Helga Goebel paddled strong to take third. It was a fine effort from Lina, the Canadian who just last week quit her safe job and now plans to travel the world for 12 months to try and make it as a pro athlete. I get the feeling we’ll be seeing her name a lot more next year. As I entered the “Upwind Graveyard” and my body shouted out to give up, several paddlers started passing me. I was in a pretty good position at that stage so the guys going past were all quality paddlers, though pretty soon it wasn’t just the guys passing me, it was the girls as well. First came Lina, followed shortly after by Brandi. 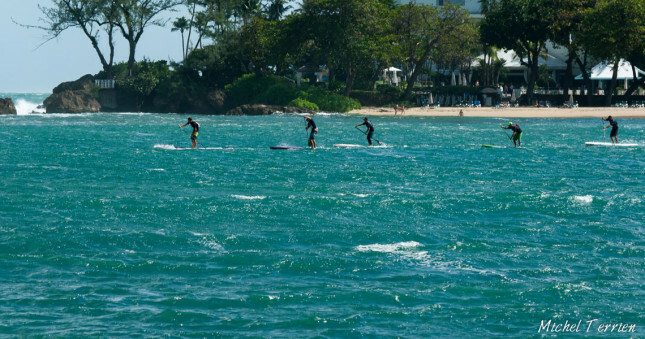 They didn’t just pass me going upwind, they seemed to sprint by… Then I remembered they were paddling 12’6 boards vs. our 14 footers… and then I also remembered they had a one minute delay after we started… So yeah. These two girls were paddling SOLID today. 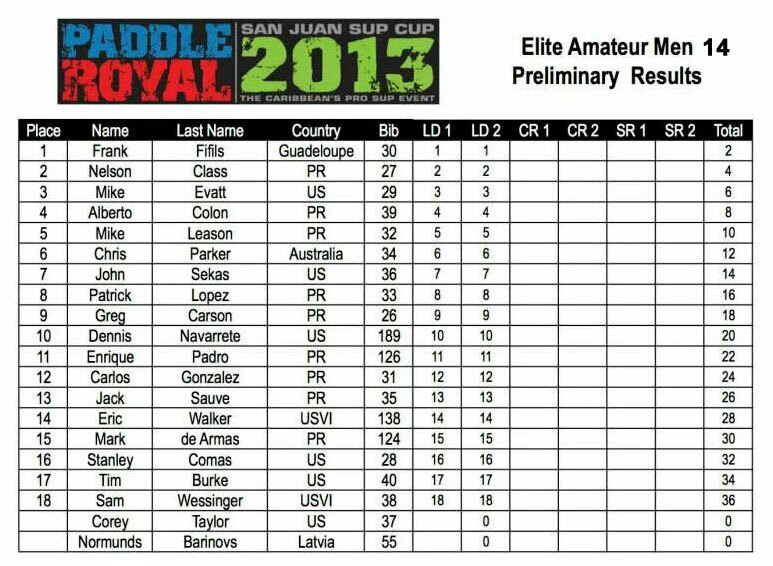 So… that was Day One of Paddle Royal… pretty brutal conditions. Check back tomorrow because this ain’t over yet. 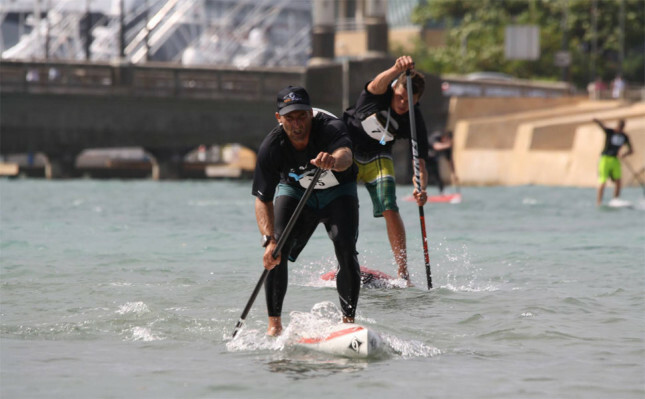 We still have two short/medium distance course races and two sprints that, all combined, will help decide who wins the overall Paddle Royal title. Eric and Lina are in the box seat, but there’s a dozen world class paddlers all very keen to cause some movement in the rankings tomorrow. 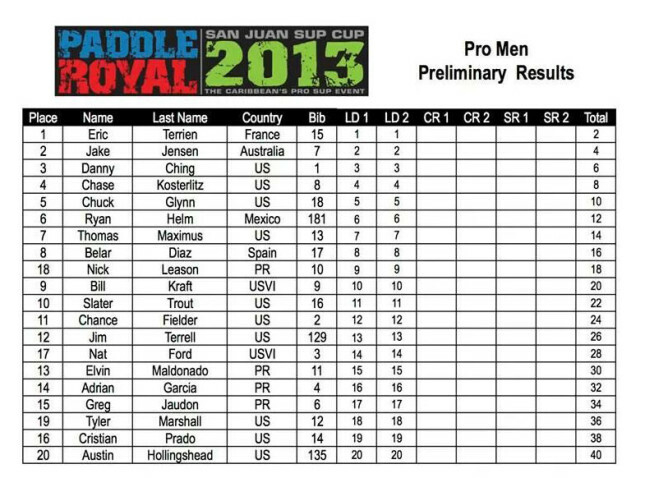 Here are the standings for the Pro and Amateur divisions after Day One. 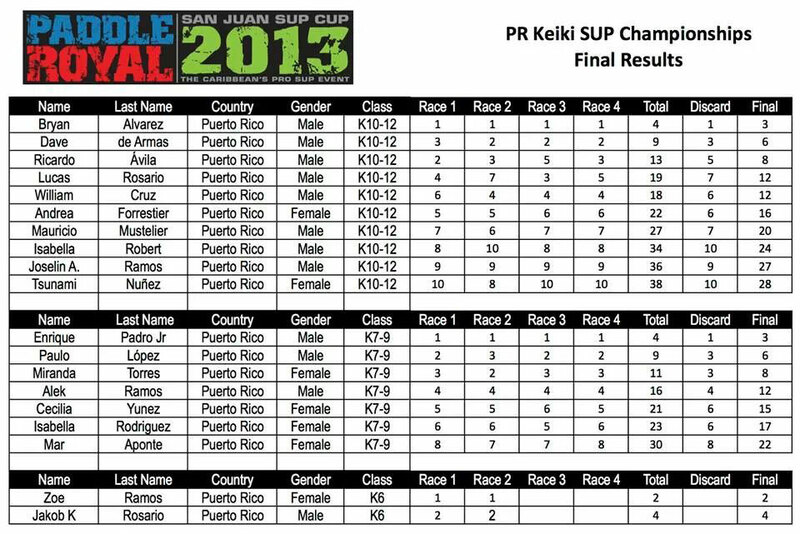 The overall results work like this… the Distance Race counts for double, then there are four short races on Day Two that each count once, giving every paddler six results for the weekend. The best five of those six are combined to produce the “Total Points” that decide the order of the final rankings (so you get to drop your worst result). So basically Eric and Lina, despite their heroic triumphs in the brutal distance race, still have a lot of work to do in order to claim the overall Paddle Royal title. Above are results for the Pro, Amateur and Kids divisions only. There were about 160 paddlers on the water and we’ll have full results for the rec racers posted soon.